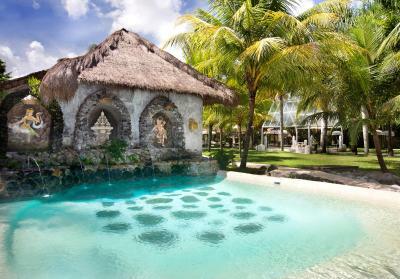 Lock in a great price for The Mansion Resort Hotel & Spa – rated 8.4 by recent guests! 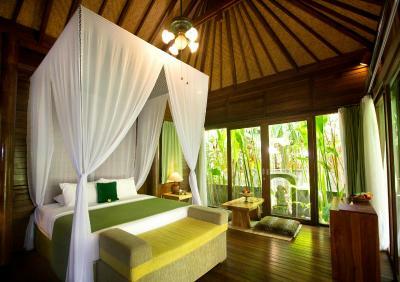 I loved the rooms and the decor, gorgeous. 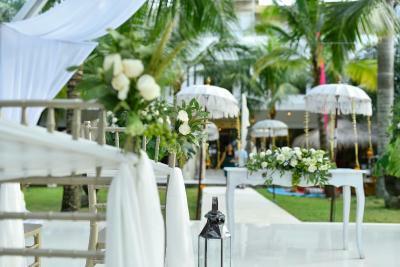 I loved the gardens on the resort, beautiful and well maintained. Quiet & tranquil. Very friendly staff. Lovely pools. 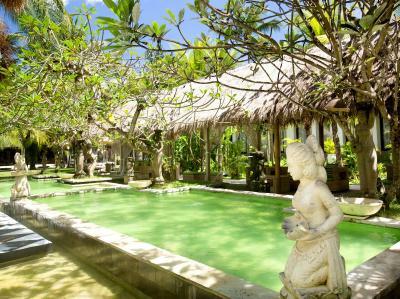 Love that it's far enough from the hustle & bustle of Ubud to give you some peace & quiet yet close enough that you will be downtown in a few minutes. The resort is gorgeous there is no question about that, I would stay there again. What can I say? This place is a gem. 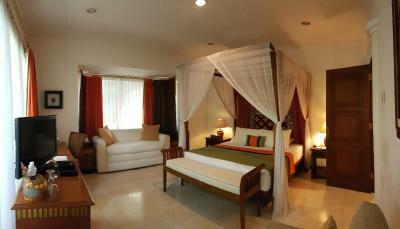 The suite we were in was large and so beautifully furnished. I loved the bed, the bathtub, the couch, everything in there. 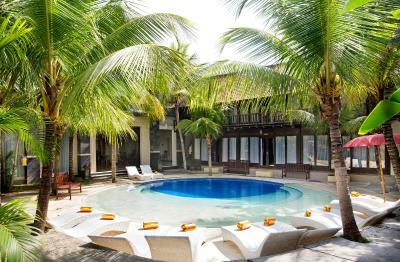 The resort itself is super beautiful with many pools and beds to chill on. Service was phenomenal. One of my best hotel experiences yet. 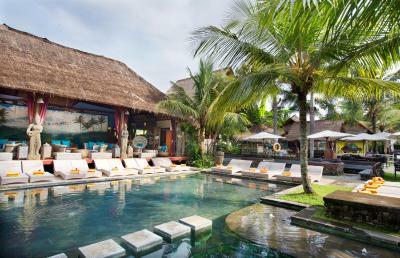 Location, value for money, has a good reputation and is close to most of Ubud’s activities. Very pleasant staff, they all spoke understandable english. Very quiet. Shuttle to Ubud was good. Food at the restaurant was good. Having our own private pool was great but the water was really cold in all the pools! The grounds are beautiful as is the layout and the rooms. 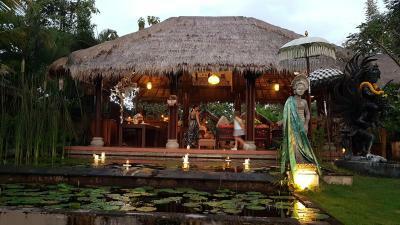 Excellent bus service into Ubud. Very friendly drivers and ground staff. It had a lovely calm feel about it. 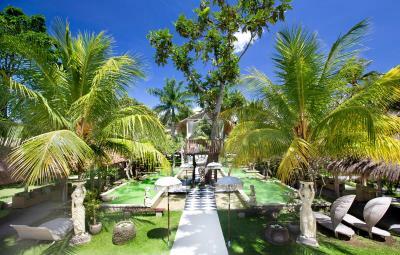 The beautiful pool area, best hamburger we very hadina while and wow the spa bath in our room! Very big installations, nice pools. 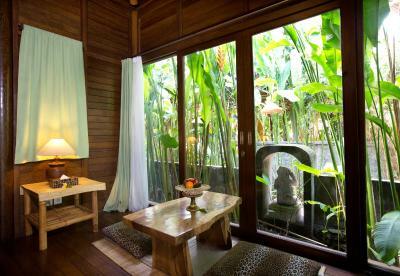 Excellent place to go relax and still be close to Ubud. The place is so calm and peaceful . The warm treatment of staff makes me feel truly at home. The ambience is simply amazing 😊 I love It! The room. The marbel bath was amazing and the hotel ground is beautiful. Has everything you need. 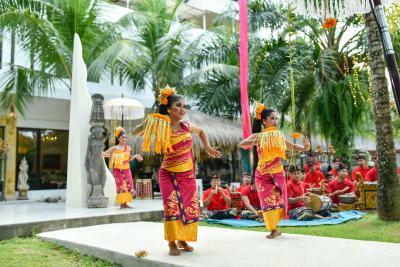 They also do a free shuttle bus to ubud centre every 2 hours which is great. 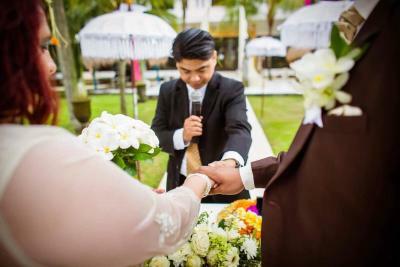 The Mansion Resort Hotel & Spa This rating is a reflection of how the property compares to the industry standard when it comes to price, facilities and services available. It's based on a self-evaluation by the property. Use this rating to help choose your stay! 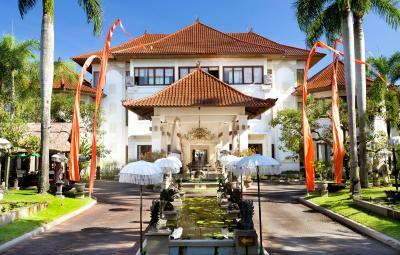 The luxurious Mansion Resort & Spa is located at the foothills of Ubud in Bali. 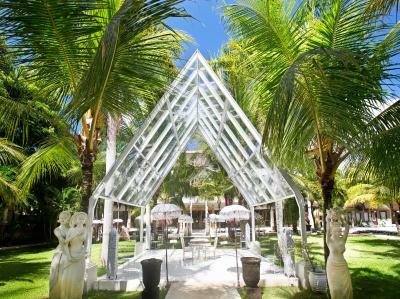 Nestled within zen landscaped grounds, it features outdoor pools and hot tubs, organic menus and extensive wellness and beauty treatments. 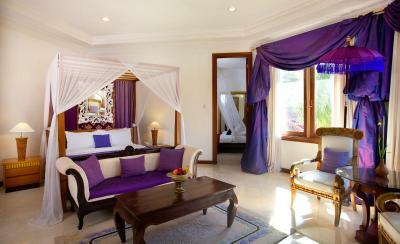 In the courtyard or within tropical gardens, each room comes with beautifully designed interiors. 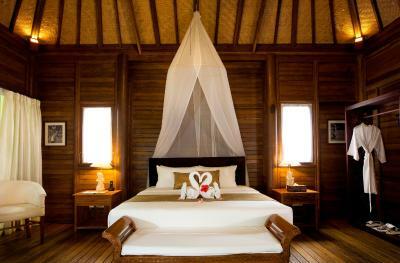 They are spacious and well-equipped with air conditioning, a luxurious bathroom and a minibar. 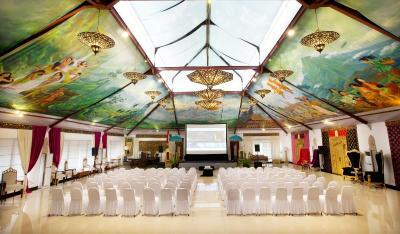 All rooms feature fine artwork from local artists. 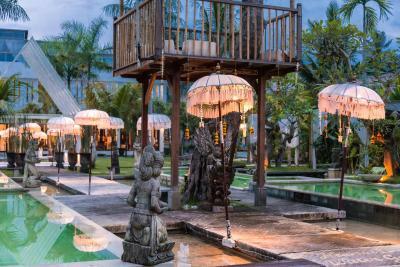 Guests at The Mansion Bali can enjoy fine dining French cuisine at Indochine or sample delicious dishes from an international menu at Café La Terrace. 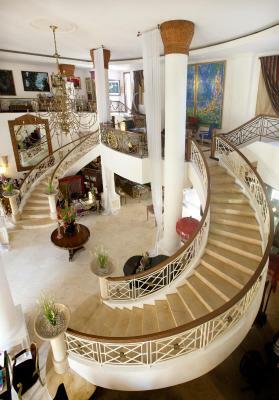 It also houses the hotel’s private art collection. 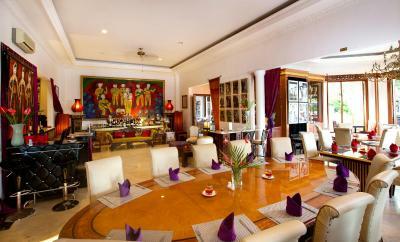 Other options include Jasmine Tea Lounge and Wantilan Bar for drinks. 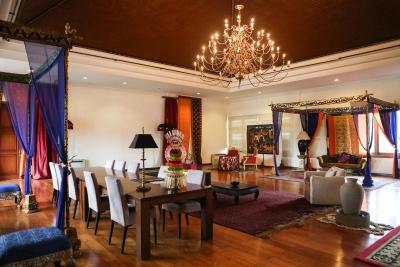 The resort offers a variety of beauty treatments like rejuvenation and spa sessions. 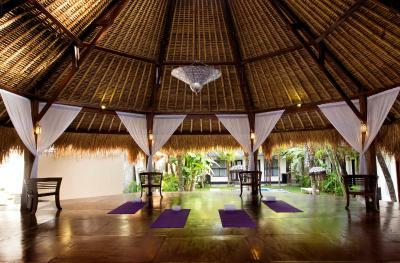 To compliment the experience, there are a series of yoga classes and therapeutic massages at the resort. Guests can also play a game of pool. 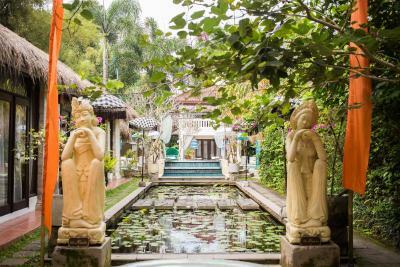 Just a few minutes' drive from the popular Kuta, Seminyak or Sanur area, Mansion Hotel & Spa is also a 40-minute drive from Ngurah Rai International Airport. 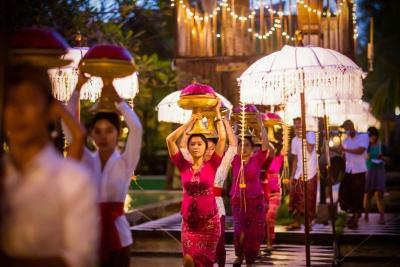 Ubud Market is less than 2 miles away. 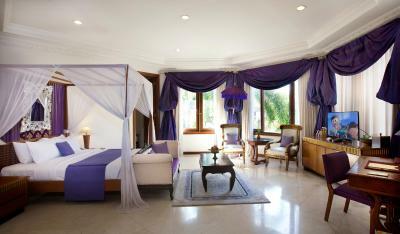 When would you like to stay at The Mansion Resort Hotel & Spa? 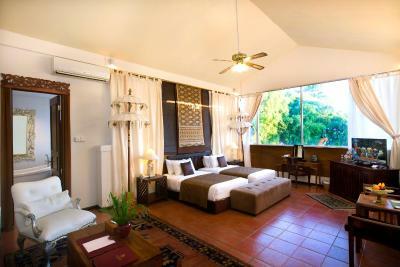 Air-conditioned room features a TV, mini-bar, CD player and an elegant bathroom with a bathtub and robes. 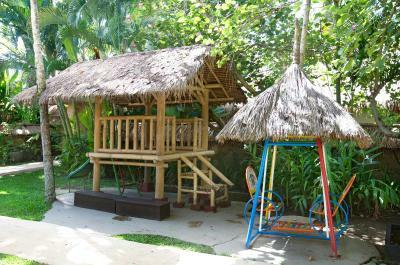 Located within the resort's sprawling gardens and features a personal safe and private bathroom with shower, bathtub and free toiletries. Please note that only a maximum of 1 extra bed is allowed. Features luxurious interiors with a large living room, high recessed ceilings with crown molding and a spacious bathroom. 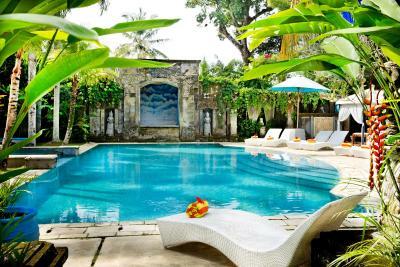 With garden and pool view, this villa is air-conditioned and features a flat-screen TV with satellite channels and ironing facilities. 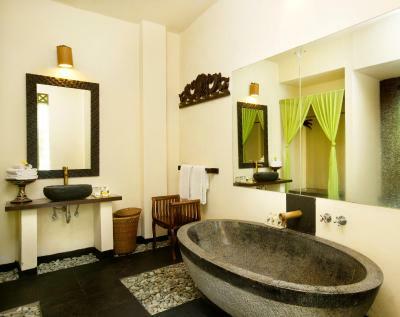 The private bathroom comes with a hairdryer, shower and bathtub. Bathrobes and slippers are also provided. 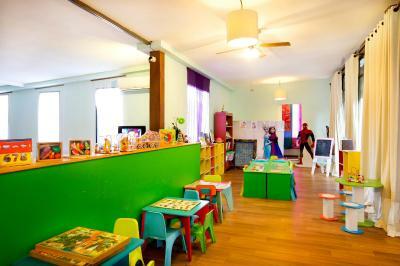 With view of the grounds, this room is air-conditioned and features ironing facilities, a flat-screen TV with satellite channels, CD and DVD player. The private bathroom has a hairdryer, shower and bathtub. 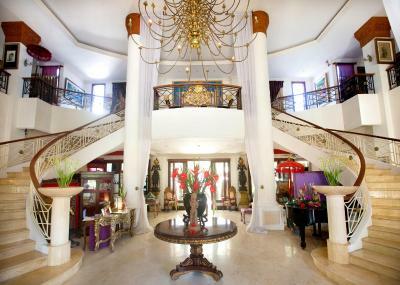 This villa has air conditioning, satellite TV and tile/marble floor. 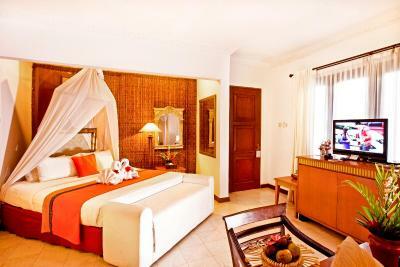 This twin/double room has a bathrobe, mini-bar and a flat-screen TV. Private bathroom comes with a bathtub. 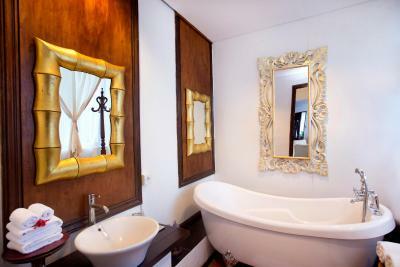 This double room has a flat-screen TV and private bathroom with bathtub and amenities. 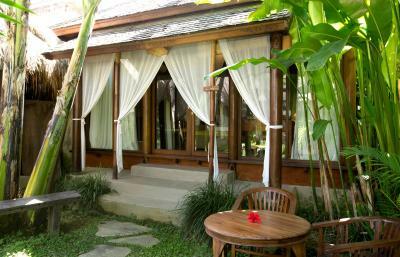 This family residence has one master bedroom, a studio with 2 twin beds, and a shared bathroom. 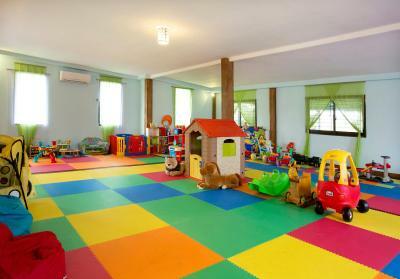 There is a semi-private common area shared with other residents. This suite features a mini-bar, satellite TV and tile/marble floor. 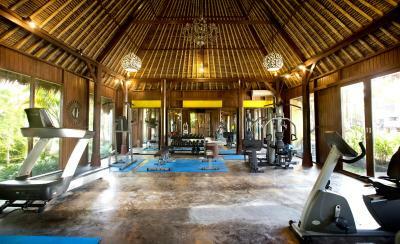 The Mansion Resort is a unique resort located just a few minute's drive from Ubud center. 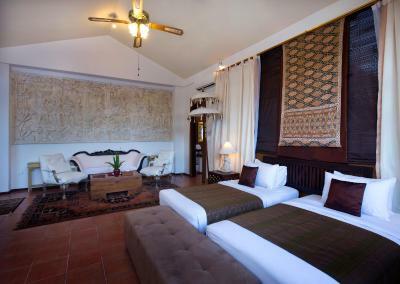 With rooms ranging from luxurious suites to rooms with thatched roofs and free standing bungalows, The Mansion is bound to have something that suits your taste. House Rules The Mansion Resort Hotel & Spa takes special requests – add in the next step! The Mansion Resort Hotel &amp; Spa accepts these cards and reserves the right to temporarily hold an amount prior to arrival. The Mansion Resort Hotel & Spa accepts these cards and reserves the right to temporarily hold an amount prior to arrival. 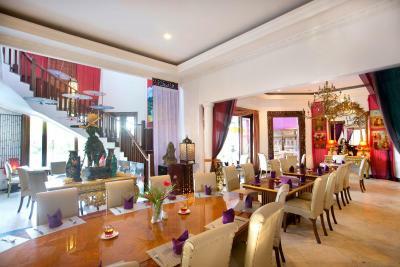 Please inform The Mansion Resort Hotel & Spa of your expected arrival time in advance. You can use the Special Requests box when booking, or contact the property directly using the contact details in your confirmation. 1/Because we were roughly in medium season (march 29), they had closed the restaurant kitchen and the young maids had to walk outdoor two hundreds meters to bring the meals and plates, from the breakfast kitchen, etc... long waitings, meals cold and very poor service consequently. 2/bathroom valving verydifficult to manage: while the shower the temperature varies suddenly from 0 to 60 celsius degrees. Very disturbing. This must be for all rooms since we had to move from one room to another during our stay. 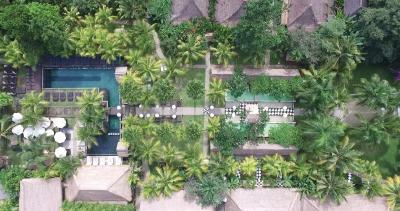 3/ the hotel is far from Ubud downtown (much more than one walking hour in a narrow dangerous road). So you have to rely on the hotel shuttle but only every 2 hours. The gardens and the pools are fantastic. This is the good side and why quite only the garden photographies are dispatched on the website. Outdoor bathroom wasn't quite to our taste, plus the private pool is more of an ornament than something to spend time in, but those are really minor quibbles. It's a beautiful setting, lovely gardens and pools all around, very friendly staff, free shuttle in and out of the centre, and good breakfast. Private villa was very private despite being in the centre of the grounds, which was brilliant. If you are arriving late at the resort, after 10:30pm, take supplies. There is no room service after this time and the bar and restaurant are closed. The mini bar is limited and if you arrive hungry it is crisps or chocolate. Very little choice for vegan dining, which consideringbthe abundance of vegan options elsewhere was a shame. Our room was a little tired and tucked away with no view, but the rest of the hotel more than made up for it. 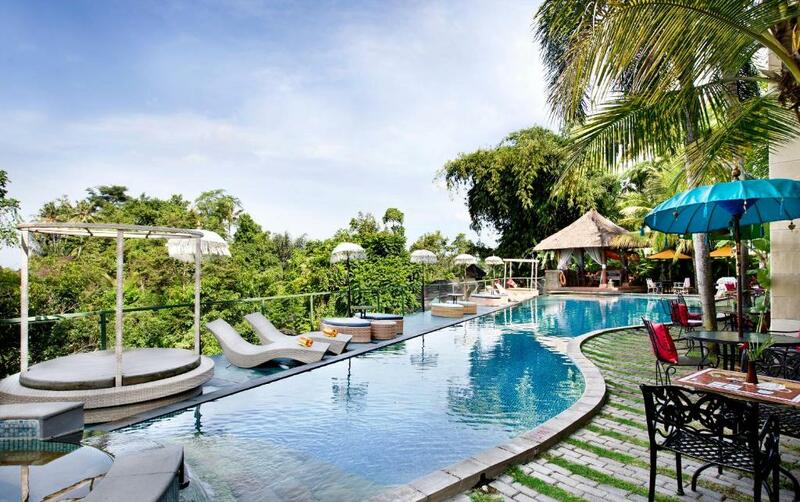 6 pools, an amazing roof top yoga space. Only downside was out of the 100's of rooms only 19 rooms were occupied when we arrived and it felt as you was the only people in the hotel. 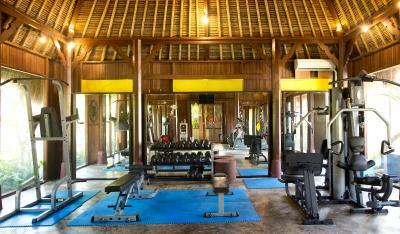 The hotel is wonderful along with all the staff, set about 2kms from Ubud central this is ideal for people who want a walk. 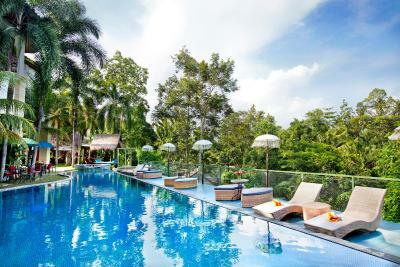 The grounds are with I think 6 swimming pools, the buffet breakfast is plentiful and I would return again and stay at this hotel. This hotel is definitely not 5 star. Whoever is managing this hotel's online presence is clearly misleading customers and it's not fair that people waste money wrongly. Bad mosquito issue, both my partner and I had so many bites that could at least be aided by giving guests mosquito products but instead the hotel charged for them, so we just bought them at the supermarket. Overall this place is run down and the 5 star rating is an obvious lie. Stayed here for a week. The ground and cleaning staff were so friendly and we really appreciated their hospitality. 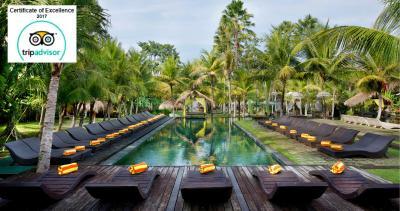 The grounds and pools are pretty to look at. Me and my partner had lunch one day in the hotel and the portion size was a little small. 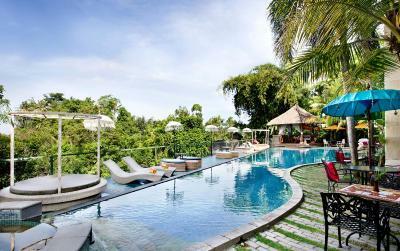 Great pools, great views from the resteraunt, really friendly and welcoming staff. All round great hotel.